Now, you can have the CRAZY COSTUME that has gone VIRAL! Funny licensed Jurassic World T-Rex instant dinosaur inflatable costume, sturdy enough for challenging video use, (hee-hee!) such as: mowing lawns, shoveling snow, cooking, doing laundry, taking out the trash, walking dogs, lounging on the couch, dancing, snowmobiling, running (or tripping), and more. Makes routine activities utterly hilarious! DON'T MOVE... SHE CAN'T SEE YOU IF YOU DON'T MOVE... Become the most famous and fearsome of all dinosaurs with our Tyrannosaurus Rex Inflatable Adult Costume! The electrical fences and advanced technology of Jurassic World didn't stop the dinosaurs from escaping and terrorizing the visitors, just like nothing is going to stop you from having the best Halloween yet when you dress in this one-piece inflatable T-Rex suit. A built-in fan will keep you cool all night, so whether you're trick or treating through Jurassic World, or going to a fun party with friends, you can definitely be noticed and still be comfortable! Costume includes an action packed full-body inflatable jumpsuit, excellent orange and brown multicolor detailing, with white scratch marks to show the most gruesome of fights! Signature yellow eyes and piercing white teeth, completes the look of this carnivorous creature. 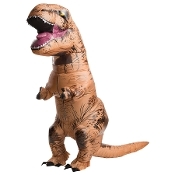 Inflatable costume has a built in hood with drawstring for easy fit, and is placed comfortably under the dinosaur head in neck area. Unisex Costume includes a zipper closure for easy in-and-out. Costume also includes a battery operated fan pack, and GLOVES. Easy assembly required. Fastenings around neck, legs and arms keep costume air sealed. Cool, super-lightweight 100% polyester construction. ADULT STANDARD SIZE OSFM, up to Size 44-inch (110cm) chest. Requires *4-AA Batteries (*NOT included). Care instructions: wipe clean with damp cloth, line dry, do not wash, do not bleach, do not iron and do not dry clean.